From the Hip Hop explosion next week department... Thanks to Elliot for the heads up! The joint tour, Fresh Rhymes and Videotape with Dilates Peoples, The Alchemist, Aceyalone, & 88-Keys @ Emo's next Monday, June 9th! Mom's eye is swollen and dry but in good health! She does however walk around with humongous eye boogers all day! She's an eye booger making factory! 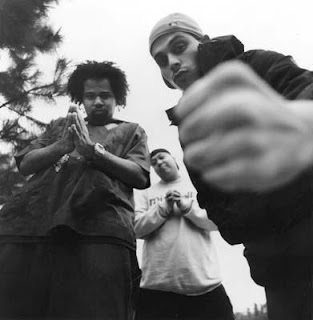 Dilated Peoples is an underground hip hop group residing in California. They have achieved great fame in the underground hip hop community, although they have had little mainstream success in the US, with the exception of the song "This Way", a collaboration with Kanye West, in 2004. They have reached the Top 40 of the UK Singles Chart with two tracks, "This Way" and "Worst Comes to Worst". Their members include DJ Babu (producer/DJ), Evidence (rapper/producer) and Rakaa Iriscience (rapper). Its members, DJ Babu from the DJ crew Beat Junkies, Evidence, and Rakaa joined together in 1992 and released "Third Degree" and "Work the Angles" on ABB Records, developing a solid fan base in the underground hip hop community. They recorded an album "Imagery, Battle Hymns & Political Poetry", which was never released, although many fans do have it on bootleg. They eventually signed to Capitol Records and released The Platform (2000) to more critical acclaim. Their second set Expansion Team was released in 2001 led by The Alchemist-produced "Worst Comes To Worst", which utilised a vocal sample from Mobb Deep's "Survival Of The Fittest" and a musical sample from William Bell's "I Forgot To Be Your Lover". Their third album, Neighborhood Watch, was released in 2004 and debuted at #55 on USA's Billboard 200 Albums Chart. In addition to the Kanye West-produced single, "This Way", it featured the single "Who's Who? ", which was also included as a track on the Need for Speed: Underground and SSX 3 soundtracks, and peaked at #35 on the UK Singles Chart. Their latest album, 20/20, was released in 2006; the debut single, "Back Again", is featured on the Fight Night Round 3 soundtrack. This is the third EA Games Soundtrack on which the group has been featured. "Back Again" is also featured on Sony's MLB 06: The Show.